SCOTUS, Midterm Odds: Will Senate Confirm Kavanaugh? Will Dems Take Back House? Brett Kavanaugh is a -500 favorite to be confirmed to the Supreme Court. Democrats are slight favorites (-125) to take back the House this fall. Republicans are -300 favorites to retain control of the Senate. Earlier this week, President Trump nominated Brett Kavanaugh to replace Anthony Kennedy on the Supreme Court. The oddsmakers and betting market nailed the pick, as Kavanaugh opened as the favorite (+175), never rose above +275 and closed between -500 and -1000 as news leaked before the announcement. Now the fight to confirm Kavanaugh begins. Senate Majority Leader Mitch McConnell has vowed to hold confirmation hearings — and then a final vote this fall — before the midterm elections take place. Kavanaugh will need 51 votes to be confirmed. Republicans hold a narrow 51-49 majority in the Senate, but with John McCain sick and a handful of Republican Senators such as Susan Collins and Lisa Murkowski voicing concerns about the potential Roe vs. Wade implications of a confirmation, Kavanaugh isn’t a slam dunk to sit on the highest court in the land. However, oddsmakers don’t seem to be concerned, making Kavanaugh at -500 favorite to be confirmed. That translates to an 83.3% implied probability. He’s +300 to not be confirmed. 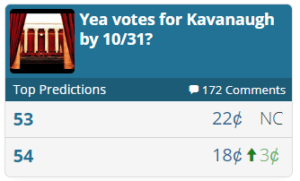 Traders at PredictIt expect Kavanaugh to clear the Senate in September and receive 53 or 54 votes, with many of the on-the-fence voters helping him get there. Is Kavanaugh a slam dunk to be confirmed to the Supreme Court? Will you be betting on any individual Senators to vote Yes or No? Do you see any value on which party will hold the majority in both houses after the midterm elections?